Crossroads Women runs the new Crossroads Women’s Centre and works to advance education on race and community relations from women’s point of view. The Crossroads Women’s Centre opened in Euston in 1975, moved to King’s Cross in 1979 and then to Kentish Town in 1996 – each time becoming integral to the local community. 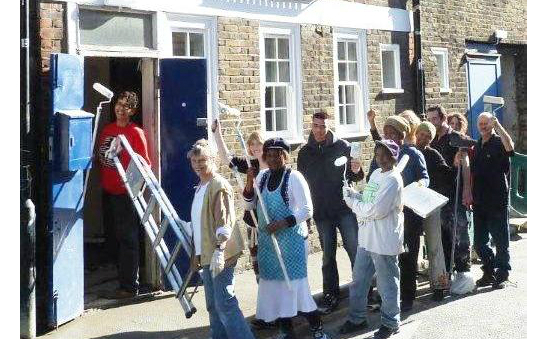 The Centre has been run by Women in Dialogue, which in 2009 formed Crossroads Women, a charitable company, to buy and renovate 25 Wolsey Mews and run the Centre from there. The commitment of volunteers, regular donations and the financial contributions of the over 15 groups based at the Centre – each with its own services and projects – have enabled it to continue all these years. The Centre’s expanding activities – including cultural, educational, publishing and self-help – led to serious overcrowding. So buying a Centre was a long-term goal. Everyone was excited when 25 Wolsey Mews, across from where we were, became available. The building was nearly derelict so we had to do a great deal of fundraising to refurbish it, make it accessible on both floors and install solar energy. The new Centre is warm, light and accessible to people with different disabilities, who have been involved from the start in the design and access audit. We also worked hard to make it as green as possible, recycling, and using reclaimed or sustainble materials during the refurbishment. We aim for solar energy to supply up to a quarter of our energy needs – we plan to keep people informed of how much we produce and save. Times are hard and getting harder. We are gratified to have a bigger community resource to offer to all who need it in order to contribute to everyone’s survival and wellbeing. We need each others’ support, creativity and determination more than ever. If you’d like to volunteer, get in touch. We are deeply grateful to everyone who, with their dedication, donations, time, skills and ideas, has made the Centre possible. We thank our funders: Big Lottery Fund, The City Bridge Trust, Community Sustainable Energy Programme & Scottish Power Green Energy Trust. Fundraising must continue. Grants, fundraisers, donations and finding good deals have gone a long way to meeting the building costs. But overall costs were higher than planned – the roof needed complete replacement, walls had to be rebuilt, floors redone, more security was urgent; we have a £50,000 debt from the purchase of the building, and now we must run and maintain the Centre. No donation is too small – or too big: each will be gratefully acknowledged. Decent office furniture is also welcome. Your ideas (and time) about funding or holding a fundraiser will get enthusiastic support and help.